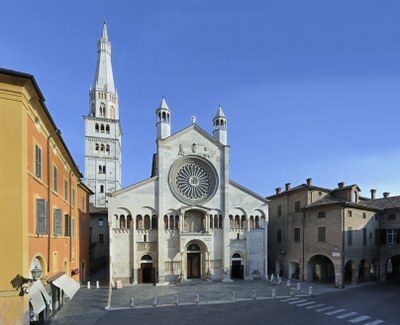 June 9th 1099 was an important date not only for Modena: it was the day construction began on the Cathedral. This masterpiece is considered to be a magnificent example of Romanesque Art which astonished society at the time and still fills us with wonder today with its extraordinary beauty and originality. An historic document, the “Relatio de innovationae eccesiae sancti geminani…”, reported that the choice of architect had been miraculously inspired by God. The Clergy and the authorities of Modena entrusted the task of planning the monument to Lanfranco, “admirable artist and builder”. He conceived an entirely new and daring kind of architecture, which had a profound influence on the Romanesque Art from that time on. Recent renovation work revealed that the brick structure of the Cathedral is faced with stone material recovered from Roman Modena. Lanfranco’s frame was then harmonically sculpted by Wiligelmo. Thanks to him and his school we can admire the splendid decoration of the capitals of the loggia, as well as the half columns and ledges of the underlying arches. These plant, animal, human motifs and imaginary creatures adorn the whole perimeter of the Cathedral at regular intervals . Wiligelmo also created the sculptures on the façade, depicting sacred, profane, heavenly and monstrous worlds. These portray the spirituality of medieval society together with its faith, hopes, fears, certainties and doubts. However, the most important example of Wiligelmo’s great art is the decoration of the main portal through which, in simple, but powerful terms, he expresses his contemporaries’ vision of society. Among the various plant motifs evoking the wood as a dreadful place symbolising the dangers of human life, we have monstrous beings of every kind, sinful creatures threatening the spiritual path of humankind, and a believer fighting a wild herd of lions, dragons and centaurs: monsters taken from ancient repertoires and medieval bestiaries. But if life is a difficult journey, Salvation is the ultimate goal, and we also find harvest scenes depicting the “Lord’s vineyard”. In the door frames, figures representing patriarchs and prophets announce the birth of Jesus Christ. These images emphasize the symbolic meaning of the church door, which separates the believers gathered inside - the saved ones, from those standing outside, who may fall prey to the Devil. However,the touching expressiveness of Wiligelmo’s reliefs from Genesis, carved on four stoned labs, remains unchanged over nine centuries. The stories of Adam and Eve, Cain and Abel and Noah’s Arc still maintain their original intensity, emotional charge, and extraordinary narrative force. In recent years researchers have shown great interest in interpreting the meaning of these reliefs, and two different schools of thoughts have emerged from these studies. The global school places Wiligelmo’s sculptures from Genesis into a very wide context which includes the medieval attitude towards work, salvation and redemption. This is why details regarding an irrecoverable loss of God may have been intentionally omitted. Work is difficult, but it is an everyday and recognisable part of the human condition. The local school, on the other hand, sees the external sculpture of the Cathedral of Modena as a local response to the problems of the town and its role in the Gregorian Reform. According to this interpretation, the four reliefs from Genesis represent very important subjects related to the Reform: sin, repentance, the need for a well-ordered and properly invested Clergy, and the central role of the Church as the only institution which offers a path to redemption. As a result, all those involved in the overall design of the Cathedral of Modena would have wanted to promote the new alliance with the Papacy, an agreement replacing the city’s previous alliance to the imperial party. Wiligelmo and his apprentices also worked on the two doors opened by Lanfranco into the Cathedral. The wonderful “Porta dei Principi”, which looks onto Cathedral Square, embraces the faithful, telling them the history of Saint Geminianus, the patron saint of Modena. The myth is visually represented and transformed into a narrative, with images of a unique quality. On the northern side, near the Ghirlandina belltower, we have the “Porta della Pescheria” (Fish-Market gate). What characterises this is the humanity of the two sculpted Telamons who appear to be asking anyone who crosses the threshold for help to carry the huge burden they have been given. Man and his work are also represented in the sculpted door frames, each depicting the twelve months of the year portrayed as agricultural scenes. The door’s archivolt instead is carved with imaginary beings, such as scenes from the Arthurian Circles, and similarly both door frames and the architrave portray animals from ancient fables emerging from intricate tangles of plant life. Of particular note are the metopes, sculptural reliefs to be found on the projections of the roof representing a lively group of imaginary and monstrous beings. The ones found on the Cathedral today are reproductions, as the originals have been moved to the “Museo lapidario del Duomo” for conservation purposes. From the second half of the 12th century to the first half of the 14th century, the Campionesi Masters succeeded Lanfranco and Wiligelmo. These were groups of builders and sculptors from Campione, a town on Lake Lugano, who worked like real family workshops. It was the Campionesi Masters who created the large rose window, the two lateral doors on the façade, and the magnificent “Porta Regia” opening onto “Piazza Grande”, which stands out in contrast to the white wall of the cathedral due to the chromatic effects of its rose-coloured marbles. The Campionesi also built the marble pulpit and parapet just above the entrance of the Crypt inside the Cathedral. Here lies the tomb of Saint Geminianus, patron saint of Modena. We also have a masterpiece from the Modena Renaissance period, the “Madonna della pappa” (Madonna feeding the child), a polychromatic terracotta group by Guido Mazzoni (1480 – 1485 ca). Inside the Cathedral we find other important works, in particular from the 15th and 16th centuries: the Altare delle statuine by Michele da Firenze (1442 ca), the Intarsia of the Choir by Lendinara (1465), the Bellincini Chapel (1475 ca), the “Table of Saint Sebastian” by Dosso Dossi (1518-1522) and the Nativity by Antonio Begarelli (1527).